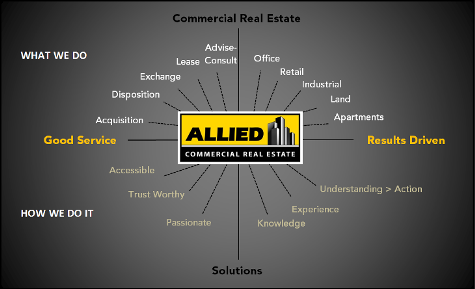 About Us - Allied Commercial Real Estate, Inc.
Allied Commercial Real Estate specialists average over 15 years of real estate experience and are among the most experienced professionals in the industry. Our associates and advisors come from a variety of backgrounds, many having advanced degrees and professional industry designations. Our associates are current on real estate trends and the forces that are shaping our local and regional markets. We are tapped into professional networks such as: the Commercial Investment Real Estate Institute (CCIM), the National Association of Industrial and Office Properties (NAIOP), the American Industrial Real Estate Association (AIR), the Urban Land Institute (ULI), California Association of Real Estate (CAR), National Association of Realtors (NAR) and numerous other professional associations and organizations. We believe in creating long term client relationships through market and property type expertise. As our motto says we are agents you can trust and we deliver the results you deserve. 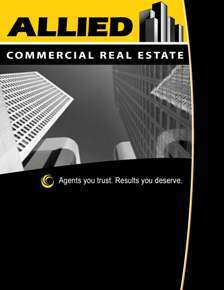 Please feel free to browse through our website to find a wealth of information regarding commercial real estate. Call or email us today to discuss how we can help you with your Real Estate needs.